Jutoh’s help system is a feature I’m particularly proud of. 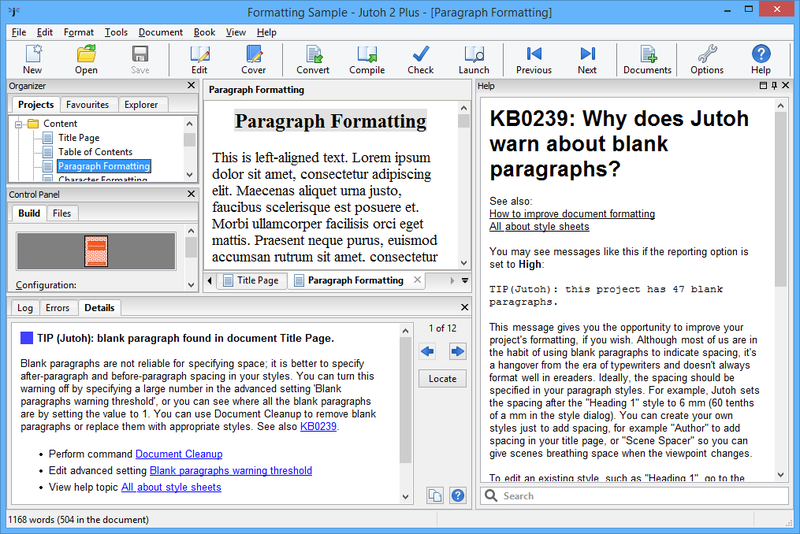 A challenge for authors is the little traps and gotchas that are common in the ebook publishing world – for example, the same reading app on different operating systems can behave differently, some distributors may have specific restrictions, an ebook reader may struggle to cope with certain formatting, familiar word processor formatting may not be as effective in an ebook, and so on. 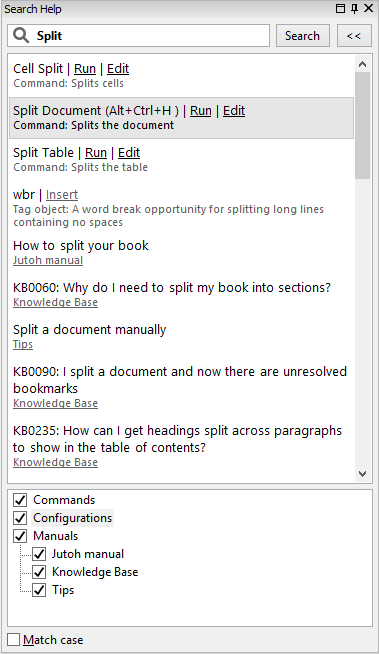 Plus, some tasks in Jutoh may benefit from a separate, easily-found topic rather than being buried in the user manual. So, what to do? A comprehensive and easily accessible help system is needed to help the user navigate this brave new world. Most applications today have their help on a web site, which is fine if you’re online but leaves you out in the cold if you’re not connected. Jutoh takes a different approach – a searchable help system that’s installed with the application and available at all times. 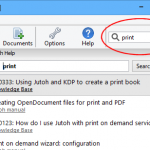 It’s keyword-searchable from a Search Help field in the toolbar – when you first use it after downloading or updating Jutoh, it will index the help so subsequent searches are virtually instant. Jutoh orders the search result by relevance, with topic titles given more priority, and keywords that are close to each other in a topic helping to boost an item’s score. In addition to the fast search engine and the user manual, there are two further key elements: a ‘knowledge base’ containing over 300 short topics aimed at solving individual problems, and Jutoh’s compile messages. 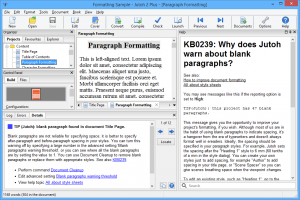 The compile messages contain hints about the problem and its solution, and often point to specific knowledge base topics to clarify what to do. 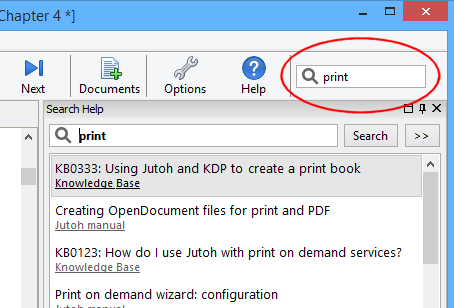 As the knowledge base grows, the more likely it becomes that any given Jutoh or ebook-related problem (for example, editing, compiling, uploading, configuring, or previewing) can be solved by typing in some keywords. You can also search menu commands and configuration options (use the >> button in the help window to add these to the search) – you can then invoke commands and edit configuration options with a click. 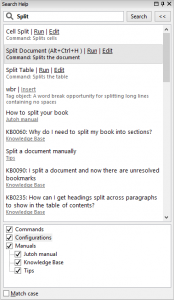 Help topics also have direct links to configurations options, and compile messages contain clickable topics and commands to speed up problem-solving. So, please take advantage of searchable help when you get stuck! If you’re still stuck, of course, do get in touch by email. The problem and its solution might spawn a new knowledge base topic!